Should I accept my Injuries Board Assessment? Authorisation is issued: what do I do next? Why should I appoint a solicitor? Gary Matthews Solicitors are experts in personal injury claims. Costs – What Legal Costs Should I Expect To Pay? the circumstances in which we deal with your case. Who pays my legal fees? Once your case concludes, we will send you a bill for our charges and you personally are responsible for paying that bill. The main issue is whether or not the other side makes a contribution towards your legal fees. The answer to this question depends on what stage your case settles at. There are four possible scenarios and we need to deal with them individually. In a large percentage of cases, the other side’s insurance company will contact us and agree on settlement of your claim. In these cases, we will negotiate payment of the vast majority of your legal fees. Sometimes, however, this may not be enough to cover your entire Bill. If the costs recovered from the other side are not enough to pay your entire bill, then you are responsible for paying the balance monies owed on your bill. it believes you to be a vulnerable applicant ( ie a minor under 18, or a person acting under a disability). 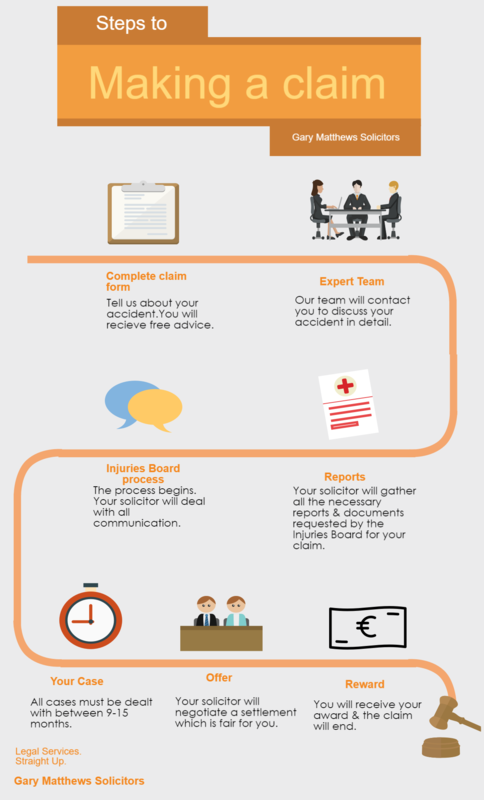 By instructing our firm to act for you through the Injuries Board process, you will be entering an obligation to discharge our costs on a Solicitor and own Client basis. Our legal fees for all work done through the Injuries Board process until the “Assessment” issues will depend on the factors outlined above and will also include vat and any outlay(s) (medical report(s) etc) which we have incurred on your behalf – it is important to note that the Injuries Board normally allows for 100% recovery of all your outlay(s) in your “Assessment” figure. Court proceedings have issued and the other side has agreed to pay my costs? You are still responsible for paying your bill even if you settle with the other side and they offer or are ordered by the Court, to pay your costs. In court cases and settlements, if your case is successful, we will try to get as much as possible of your costs paid by the other side. We will tell you how much money the other side is prepared to pay towards your bill. Sometimes, however, this may not be enough to cover your entire Bill. You can then choose to accept it and pay the difference or to have your bill taxed, that is, assessed by the Taxing Master (a court-appointed official) who will decide what costs you should pay. If the costs recovered from the other side are not enough to pay your entire bill, then you are responsible for paying the balance monies owed on your bill. If there is a shortfall in your costs we will advise you of this. Court proceedings have issued and my case is settled on a compromise basis with an “all in” settlement to include legal costs? On a very rare occasion, a case has to be settled on a compromise basis (due to liability issues and/ or indemnity issues with the insurance company) with an “all in” payment being made to include legal costs. This means that you personally will be responsible for paying all your legal costs, without any contribution from the other side. When this arises, we will advise you of the totality of your legal costs prior to agreeing to settle your case, so that you are aware of the exact figure you will be receiving for compensation. Copyright 2016 Gary Matthews Solicitors - All Rights Reserved - Designed by Rockstown Ltd.